DirectAccess IP-HTTPS Preauthentication using Citrix NetScaler | Richard M. Hicks Consulting, Inc. This is quite concerning, that an unauthenticated person can build a topology map of your internal network. Won’t terminating the SSL on the Netscaler break OTP authentication, where its a requirement that SSL terminates on the DirectAccess servers? Would a mitigation be to remove PING from been IPSEC exempt? Has Microsoft been notified of this? It seems like a security breach to me. Is it possible to do the same pre-authentication using F5 load balancers? Sorry for so many questions! Keep up the good work. To be honest, it isn’t as bad as it seems. It really is trivial to filter ICMP traffic, so that isn’t a huge concern. However, so very few people do it that it does present a potential risk. The biggest issue has to do with IPv6 DoS attacks. 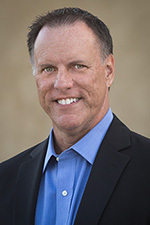 The important thing to realize is that it is not possible to compromise the IPsec connection, so there’s no risk of data exposure at all. You are correct, terminating SSL on an ADC does fundamentally break OTP. Thanks for reminding me of that. I’ve updated the post to reflect that detail. In addition, it is possible to do this with the F5, it’s just not as easy. I’ll be documenting that in the near future, time permitting. instead of a Citrix NetScaler or F5 BIG-IP? 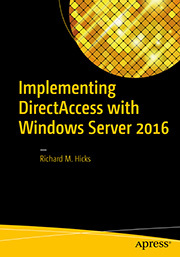 I believe this still works with DirectAccess in Windows Server 2012 R2, but it isn’t recommended because it disables support for null encryption for IP-HTTPS connections. It might not be an option for people using OTP, as that disables null encryption and the SSL must terminate on the DirectAccess servers and not a load balancer in between. I’m trying to promote the use of the ADC for pre auth and NLS, but getting lost in the licensing. If I read the spec sheet correct the VPX Standard license does not support authentication, does this imply we need Enterprise to be able to support DA as you describe it here? I’m not that familiar with Citrix licensing at all, but if the standard license doesn’t allow certificate authentication then yes, a different license will be required. Can you advise which version of Netscaler software you are using? I have attempted to implement this on 10.5 (61.11), and have working Windows 7 clients, but Windows 10 clients report errors indicating the traffic is being modified by the load balancer. When the Load balancer is put into SSL_Bridge mode, both clients work but I lose the opportunity to pre-authenticate clients & perform the SSL offloading I had hoped to achieve. Curious to know if version 11 fixes this before I embark on the upgrade. As it stands today, this will only work on the VPX platform. There is a bug on the MPX platform that results in the issue you are having. I’ve been told that it will be fixed soon. Once I have that information I will post an article on it shortly thereafter. Stay tuned! Hi Richard, Do you have any Bug ID or Case ID @Citrix for this particular issue on the MPX appliance? I confirm this is not working again on MPX 11.1 build 47.14 the same build is working on VPX of DA SSL (not SSL_Bridge). Not that I can share, sorry. And yes, the bug only affects the MPX platform. No issues at all with any version of VPX so far. I will be making an announcement on this web site as soon as a validated working build for MPX is available though. Stay tuned! You have to include null cipher suites for Windows 10 clients to work. For anyone else reading this, please know there’s a bug in the NetScaler MPX and SDX platforms that will produce this same result even with null cipher suites enabled. This is due to a bug in the NetScaler software. Citrix is working to resolve the issue as we speak. Once they have resolved the issue I will post information here. I found the solution to my problem. TLS1.2 Certificate request specifies which signature algorithms it accepts with “supported_signature_algorithms”. The server certificate bound to LB vsrv was signed with RSA SHA256 and therefore NetScaler told the client it wants a RSA SHA256 certificate. My client certificates are signed with RSA SHA1 so the windows replied with empty certificate and NetScaler terminated the handshake. TLS1 and TLS1.1 don’t specify the supported signature algorithms, so I disabled TLS1.2 and it works perfectly. Better solution of course is to upgrade the certificate authority to support and issue certificates signed with SHA256. Thanks for this article. In a earlier comment you state ‘It really is trivial to filter ICMP traffic, so that isn’t a huge concern’. Can you elaborate on this, do you mean to say we should simply block IMCP IPv6 on the Direct Access servers via Windows Firewall? Correct. To prevent internal network reconnaissance from an unauthorized client, blocking ICMP echo requests anywhere will mitigate this particular risk. 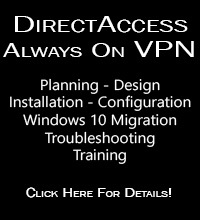 It can be done on the DirectAccess server itself using the Windows firewall, or if a firewall exists between the DirectAccess server and the LAN, it could be done there. However, keep in mind that this does not mitigate the risk of DoS attacks against the DirectAccess server or connected clients.